The ship was excellent, so much to do, so organized, balcony room was worth every penny. The rooms were so clean, much better then i&apos;ve found with other cruise lines. Employees were great, they even learned our names. Boarding and getting off the ship was very organized, quick, and efficient. 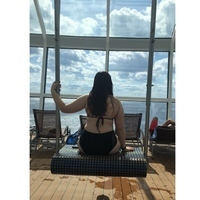 Having the app to use was a very nice feature, I could upload a photo on the app rather then having to get a photo taken when I went to board the ship. I stayed in a balcony room and the room was very beautiful and very spacious actually. There were features in the room that made it great, such as a usb plug to plug my phone into rather then having to bring the charging block. There was so much to do and the booking process was very easy as well, that includes booking our excursions and purchasing our drink packages online. There isn&apos;t a single bad thing I could say about the boat, employees, or our trip in general. I really liked that the cruise line offered so many different excursions because booking excursions through the cruise line made me feel safe when off the boat and there was no shortage of options. Their private island CocoCay was beautiful as well, best port i&apos;ve been to by far, the SeaDoo and glass bottom boat excursions were amazing - I would definitely recommend. I think the ship was well worth the money spent and I would strongly recommend it. AMAZING. Clean, the layout of the room made it feel very spacious, there was a ton of storage space for both me and my sister (who both brought a lot of stuff with us) to unpack everything. The bed was large and very comfortable. There were certain features, such as 2 USB plugs but also plugs and side tables on both sides of the bed that made the room that much better. There was also mirror in the room, with lights all around it, and a counter in front of it so that both me and my sister could get ready at once, instead of only having a mirror and counter in the bathroom so only 1 person can get ready at a time or so that 1 person could be doing their hair/makeup while another person is in the bathroom showering etc. I really enjoyed that feature because with 2 girls trying to do their hair and makeup for dinner it was much better than us trying to both do that in the washroom. The washroom was surprisingly spacious as well, the shower was large too. The furnishings were beautiful, bed was very comfortable and large too, plenty large enough for 2 people to sleep in. This is where we boarded the ship, it was a nice place to leave from because they had a parking garage you could park in. It was very large so we didn&apos;t have a hard time finding a spot, plus it was a safe place to leave the car while we were gone and it wasn&apos;t expensive to park. We didn&apos;t have the worry about the car at all and we weren&apos;t far away so it was a nice feature that we could just drive to where we were boarding the ship, rather than needing to get a ride. the glass bottom boat was exceptional. It was fun, they let us hold things like starfish and sea cucumbers if we wanted to. They pointed out all the different types of fish and sea animals we saw. I would do it again. It was fun, the guides asked us before we went out if we wanted to go fast or if we were more comfortable going slow in order to ensure we were in the right order to have the most fun. Once everybody was given a spot in line we did a short tour and then would stop and make sure everyone was comfortable with there spots in line or if they thought they may like to go slower and wanted to go closer to the back of the line or vice versa. The views were beautiful and the guides were fun as well. Atlantis is an exceptional excursion and since we booked through the cruise line then the shuttle there was included, there was a meeting spot right off the boat where we met the guides and they made sure everyone was there then took us to the shuttle and when we got to Atlantis they showed us exactly where to meet and what time to meet to get the shuttle back to the boat, then they showed us around Atlantis as well. We purchased our tickets to Disney World independently but one of the excursions we booked through the cruise line was a shuttle there. Personally Disney World wasn't exciting but the shuttle there was very organized and made it easy because we didn't have to worry about getting there and getting a ride back to the ship on time because the shuttle picked us up with plenty of time to get back to the ship.